Winter is a time to take stock. Once you've dug up or mulched your dahlias, planted your spring bulbs and cut down and composted the annuals, you have time to assess your garden space. Look back at what worked this year and what you would change. Although things have slowed down, there are still treasures to be discovered in the garden. 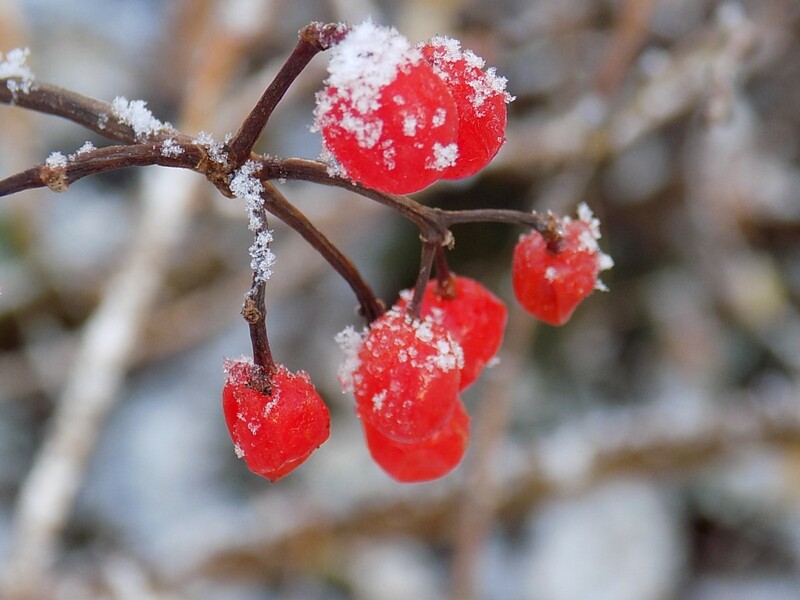 Winter-flowering shrubs really do come into their own at this time of year and many of them are highly scented. A few sprigs of Viburnum bodnatense brought into the house will scent a whole room. We have a lovely winter flowering cherry (Prunus subhirtilla autumnalis) at the front of the house which flowers throughout autumn and winter. A few cut branches brought into the house when in bud will gradually unfurl to reveal pretty cherry blossom flowers. 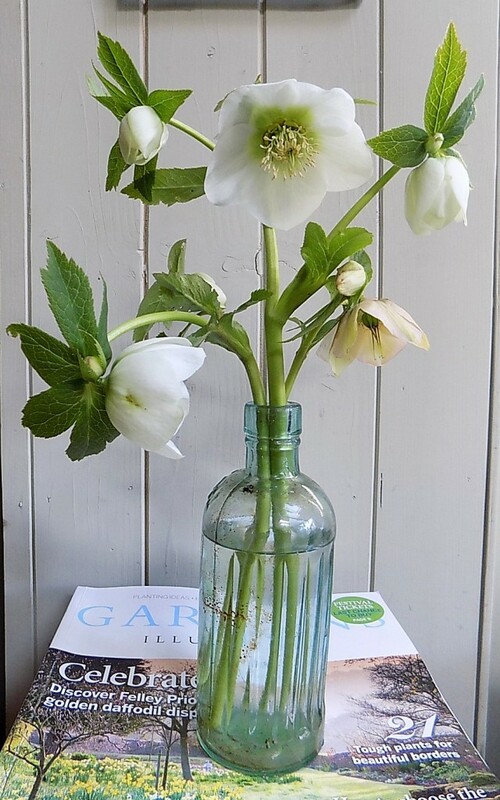 This year, my Hellebores have been early to flower, starting back in November. They are one of my favourite winter flowers and can be relied upon to flower usually from December/January all the way into March. Every cutting garden should include them. If, like me, you planted some paperwhite narcissi in the autumn, they should now be ready to bring into the house. 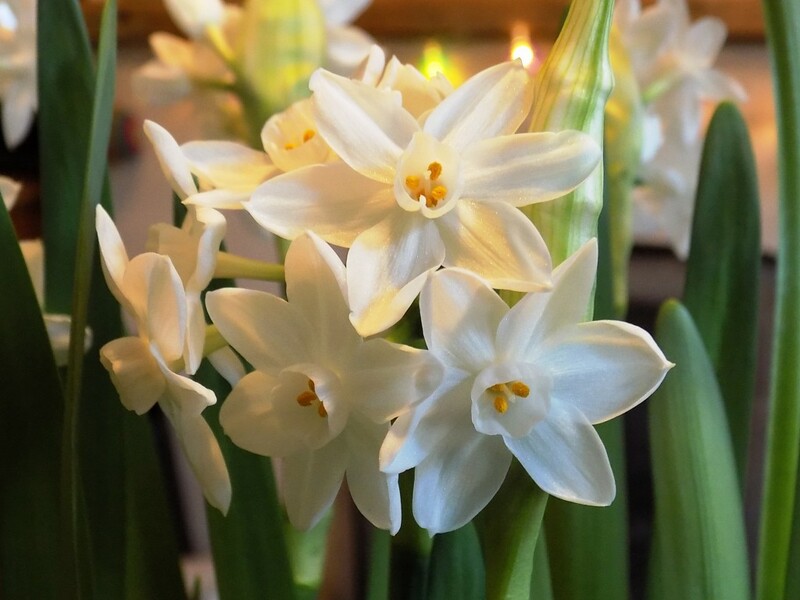 A big pot of these bulbs makes an elegant and fragrant display. Forced Hyacinths are another option. Mine sadly have to be relegated to the table in our courtyard garden as their scent is a bit too strong and seems to give me a splitting headache. 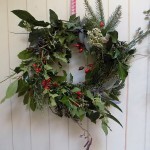 I hosted my first ever wreath-making workshop this December and it was such a fun, festive day. 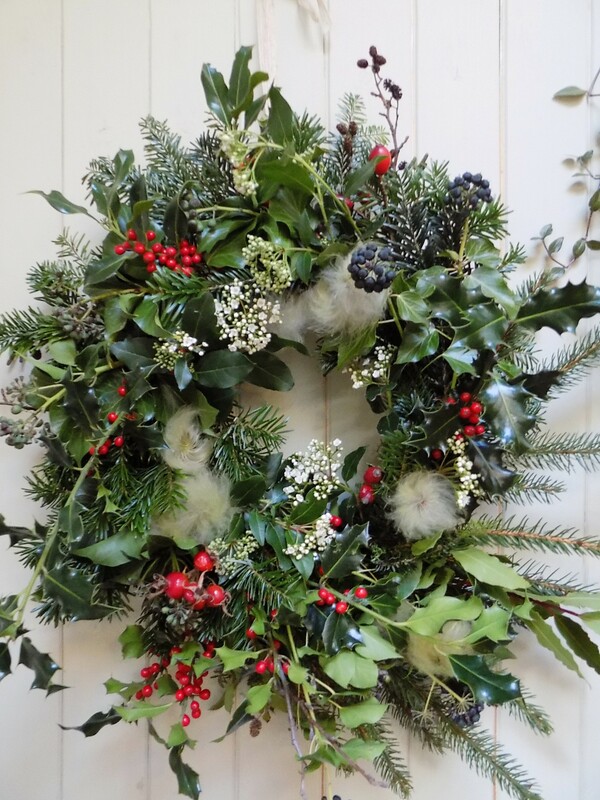 Some lovely friends attended and we used foraged materials - Holly, Ivy, Yew, Christmas tree trimmings, Rosehips, Sage, Virburnum tinus, Rosemary, Clematis seed heads, Catkins, Bay, Mistletoe and Alder cones to make our wreaths. 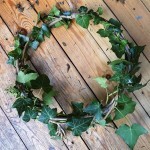 We used grapevine wreath bases as they are a natural material and are perfect for poking in stems of cut material. We wired bunches of foliage to the wreath and then added highlights of rosehips etc.. to fill in any gaps or to hide any wire left exposed. Attach your hanging ribbon at the start. Wire everything in tightly and overlap successive bunches of foliage so that each bunch hides the wired-in stems of the preceeding bunch. 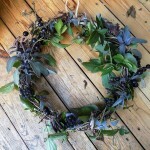 Attach your foliage bunches so that stems all face in one direction around the wreath. Even the most craft-phobic of us were really pleased with the results (pictured below) and surprised at how artistic they could be. I'm not sure if the mulled wine actually helped us but it certainly added to the festive spirit. We've had a few snowy days here in Norfolk this month which has caused much excitement among the smaller members of the family. 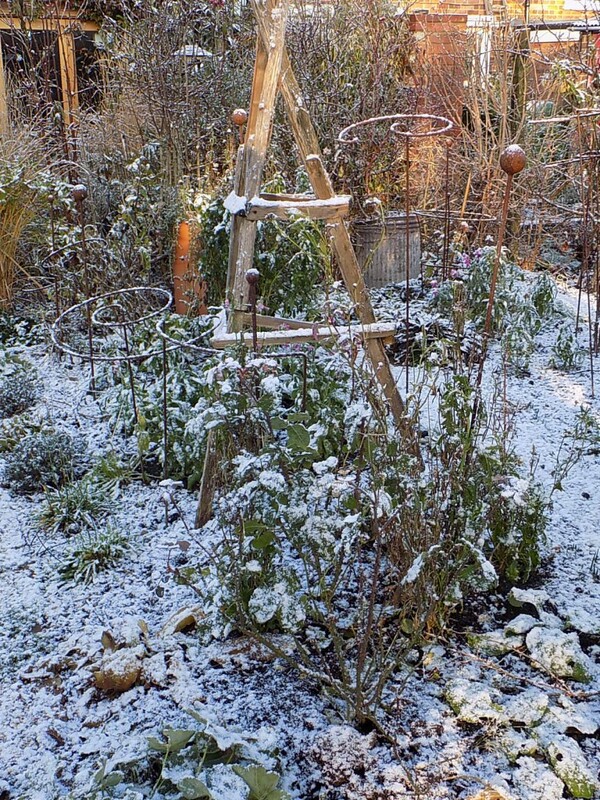 An otherwise fairly bare garden looks wonderful cloaked in a dusting of snow. We like to spare a lot of seed heads and skeletons from perennials such as fennel and Sanguisorba (rather than cutting them down after flowering) as they look so nice with a covering of frost and provide some winter interest. In the cutting beds, I like to keep the sweet pea obelisks in place along with the metal supports that I use as they look quite sculptural in the beds over the winter months. Hidden under the layers of snow and soil are spring bulbs, including lots of tulips. Dotted about are biennial foxgloves, wallflowers and sweet williams that will survive the winter frosts and bloom in the spring. 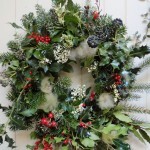 I always make a fresh flower wreath for the front door from anything flowering in the garden in December. This can vary from late-flowering Chrysanthemums sheltering in the potting shed, the almost constantly flowering perennial wallflower Erysimum 'Bowles's Mauve' and winter-flowering Viburnums. I usually use a base of clippings from the Christmas tree as quite often the lower branches need removing in order for it to fit into its pot or else I use yew cut from the hedge at the front of the house. You will need to use either a moss base or a foam base which has been pre-soaked before use. 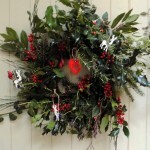 It may need a good soaking every now and again to keep it moist so that the fresh flowers last the whole of the Christmas period. Cover this generously with the Christmas tree trimmings. Our tree is a Nordmann Fir and every year we choose it from the Elveden Estate where, for a small contribution to charity, it is pulled to your car by adorable Newfoundland dogs bedecked in tinsel and bells. This year we were a bit too late for the dogs as 6 year old Rosie spent so long choosing an outfit which was not at all appropriate for the frosty weather. We had to make do with a quick pet of the dogs that were being loaded into their owner's cars and Rosie pretended to be a dog and help pull the tree to the car. Not quite the same, but she was placated. 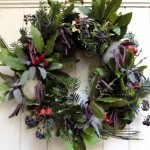 Back to wreath-making.. Over the base of fir, I added Viburnum tinus. With its delicate white flowers, it's a favourite winter foliage plant in the garden. I then added a few sprays of large and small rose hips from our hedge. I finished with some Leycesteria formosa which has racemes of flowers with dark pink bracts which look very seasonal and a few sprigs of Viburnum bodnantense. This variety of Viburnum is a fabulous winter-flowering shrub with fragrant clusters of flowers appearing before the leaves on bare stems. I often clip a few branches to place in a jug where it will scent a whole room. There is little to do in the cutting garden over the winter months but every time I venture out to the compost heap with the green waste from the kitchen, I take a look at what is flowering and snip something to bring inside and display. 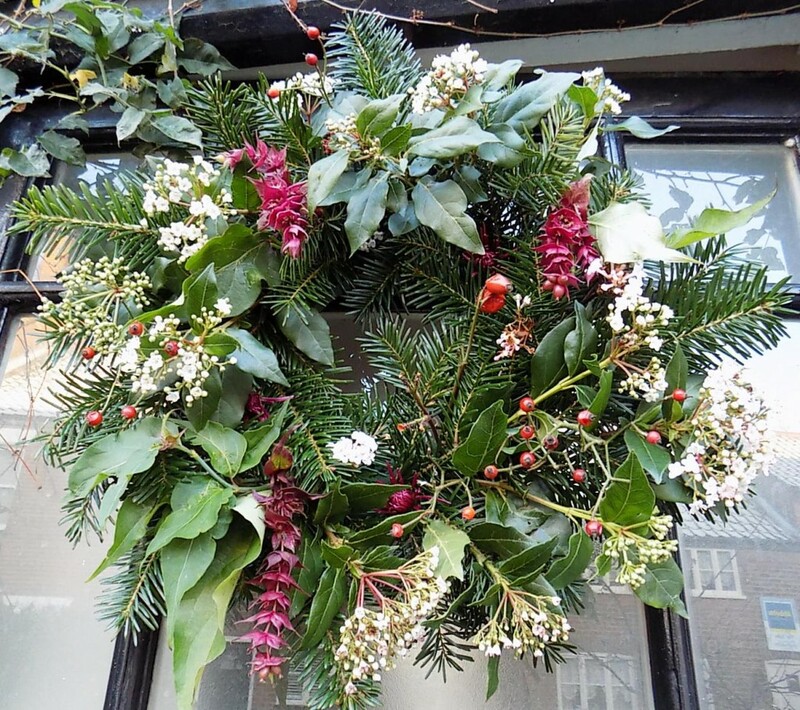 Cyclamen, winter-flowering shrubs, Holly, Ivy, evergreen foliage and the first Hellebore flowers are all brought in regularly so that their beauty can be appreciated inside. The time freed up in the winter is taken up with crochet projects. 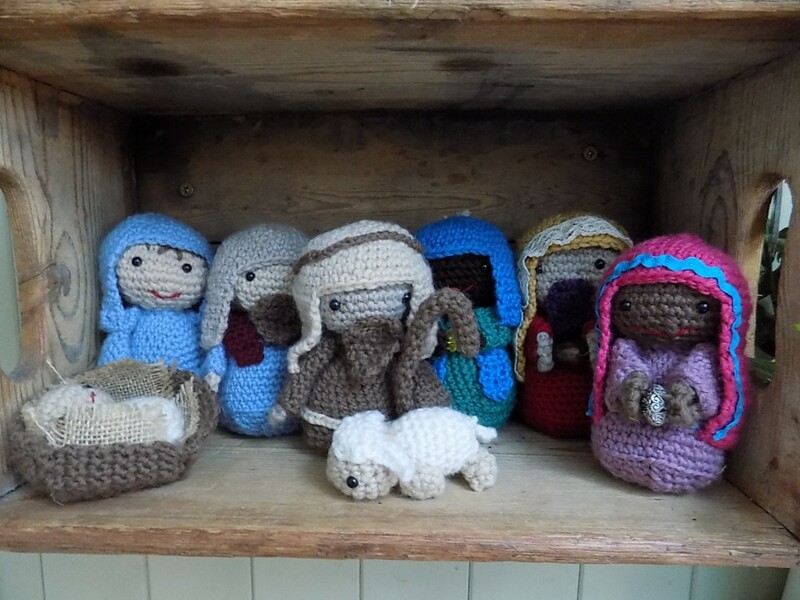 Last year, I made this little nativity scene (I decided that one shepherd was all I had room for). My next project is a crochet Snape figure from Harry Potter as requested by my Potter-obsessed daughter - wish me luck! If you are looking for a Christmas gift for the gardener in your life take a look at my pressed flower pictures made from our cutting garden flowers in my Etsy shop or consider a gift voucher for a Home Flower Garden workshop.